hotoke "Buddha" in this context means a dead person. In former times people often felt cursed by the gods or by ancestors or enemies. To help solve their problems, they asked a medium for help. 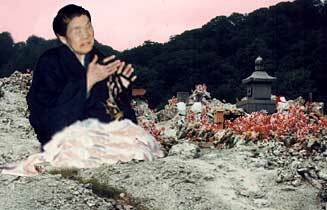 The Itako shamans of 恐山 Mount Osorezan, Aomori can get in contact with dead family members.
. itako いたこ / イタコ Itako medium, female shaman . - Read an encounter of myself, using a Japanese Itako medium to get to my dead German father. also have these medial powers. What does one do when beset by illness, bad luck, or a case of lost keys? If you’re in Okinawa one possibility is to consult a yuta. 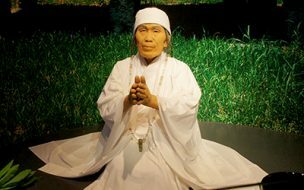 The yuta are female spirit mediums who have been around for centuries, though it was not always easy for them. ..... The noro were the official priestesses of Ryukyu. ..... Compared to the yuta, the noro are an interesting contrast. At the most basic level, noro were priestesses, while the yuta were spirit mediums. They were both women involved in rites, rituals, and spiritual work. ..... Being a yuta was a self-proclaimed vocation, with no requirements needed or qualifications to be shown. If someone had a problem they could pay a yuta to consult with the spirits and find a solution, and there were always people with problems. -- In both Kagura and Noh the descent of the deity is called kamioroshi. -- The kami-oroshi abolishes the categories which uphold ordinary reality, so that man and deity are basically equal and most participate in the festival as equals. -- kamioroshi (かみおろし) include 'invoking a deity during a festival held in that deity's honor'. Toigiki was quite popular in Niigata.
. 淡島様 Awashima Sama . The shrine Awashima jinja in Wakayama is well visited by women praying for childbirth.
. toigiki - 不動明王 Asking Fudo Myo-O for help . In Niigata, toigiki トイギキ is also called ホトケダシ hotoke dashi or ホトケの呼び出し hotoke no yobidashi.
. shiratsuke シラツケ / shiramono tsuke シラモノツケ oracle . Every year on the 12th day of the 12th lunar month, there was a festival for Yamanokami. At 当屋の家 the home of the festival leader Kamioroshi occurred, which was called shiramono tsuke シラモノツケ. A Yamabushi mountain priest and the villagers offered prayers to have the Kami come down to 男のミコ the male Shrine disciple. The Kami would jump around in the room of the Miko and then give takusen 託宣 an oracle. The jumping and dancing in the room was called okagura オカグラ O-Kagura. The blind ミコサマ Miko Sama (Itako) from 駒林 Komabayashi village was 20 years when she started her career as a student with another Miko Sama. She became quite skilled in calling the spirits of dead people into her body. A grown-up had to be dead for 49 days, a child for at least 35 days. An old woman who had lost her husband came for a meeting. 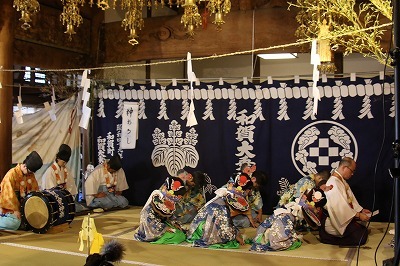 The Miko Sama put on 白衣 white robes (of the dead), performed o-harai オハライ cleansing rituals and then begun kamioroshi 神オロシ to call for a Kami. The protector deity of the village, 鎮守様 Chinju Sama came to her, but after that she did not remember a thing. In the back of the mountain is a shrine of 十二山神社 Juunisan Jinja. Its festival for Yamanokami, the Mountain Deity, is on the 12th day of the second and 12th lunar month. Should they go to work in the mountain forest? Should they care for the fields? How will the harvest turn out? Who is going to win this or that law suit? and any kind of personal question.
. 山の神 God of the Mountain and 十二様 Juni Sama "Honorable 12" deities.
. Yamanokami Matsuri 山の神祭り Festivals for Yama no Kami . Tonchibo is also a local name for the Deity of the Mountain, Yamanokami 山の神, and thus a taboo word for the local fisherman. Kamioroshi カミオロシ is held in his honor. After the sudden death of a parent, the son went to 八海山 Mount Hakkaisan to have Hotokedashi performed. "I was cursed by someone! I can not tell you who that was, but do not fall into the trap of someone who curses people. Don't give up, don't give in. Stay strong and I will be able to go to the Buddhist paradise (joobutsu 成仏)." On the way to the mountain the luggage of the cow's back always begun to slide, even if he put some stones on the other side. The oracle told him that he should venerate the Jigami ヂガミ Kami of the Land. When he did, the luggage was straight from that day on. Next time he went to the mountain, he took the stones and threw them away. But now again he was cursed by the Jigami. The Toigiki medium told him he should venerate the stones as the Jigami himself to find peace. Jiten, Chiten 地天 "Earth Deva" . There are various places where people go for this in need of advise. 相川の二ツ岩サン Futatsu-Iwa San of Aikawa and others. Many go there during the O-Bon rituals for the ancestors. But if you call a dead spirit back too often, it will decrease its status in Paradise, so there should be a good reason for doing it. "There is a local saying "If you do not venerte Jigami, the area will be cursed". Not only the one family that forgets to venerate, but also the next 7 neighbours will come under the curse. Many families feeling under a curse visit a Shaman (like Arima san or Dondokoya) to get relief and instructions on how to venerate the Jigami. People from Sawata often went all the way to Mount Osorezan in Aomori to get help from an Itako medium. A child very much beloved by his mother died, but she had forgotten to put his favorite toy in the coffin and he could not cross Sanzu no Kawa, 三途の川. the river to the other world. He had called his mother but she did not hear him and so he got stuck in limbo, as the Toigiki told the mother.
. Sanzu no Kawa 三途の川 River Sanzu, the river on the way to hell .
. Fudo legend from Yamanashi .